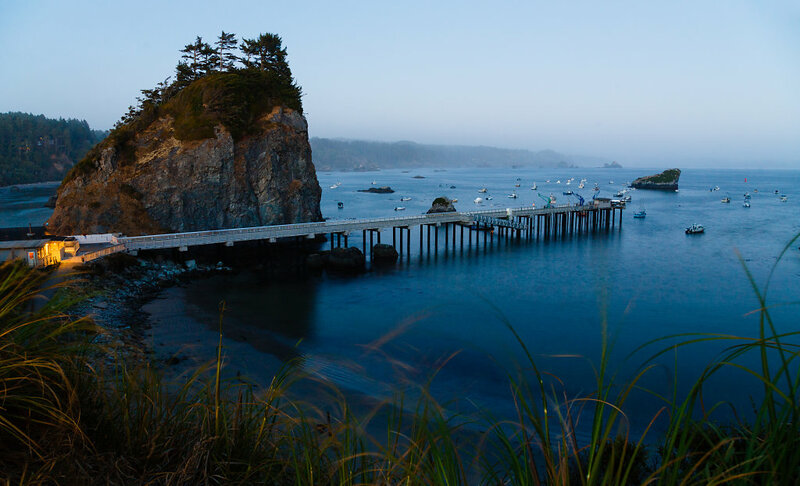 Two summers ago I had the great opportunity to visit the town of Trinidad, California - a rugged and eroding bay with a quiet seaside charm. 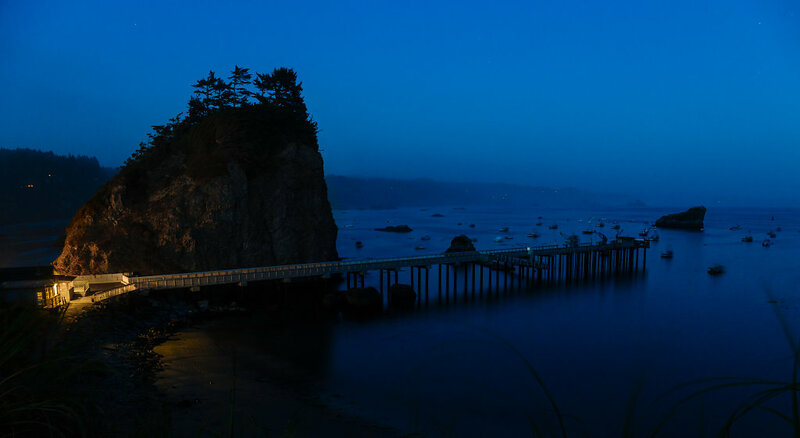 One of the shots I had in mind was a night view of the Trinidad Pier, stretching out 550 feet past the massive Little Trinidad Head and into the rocky harbor. 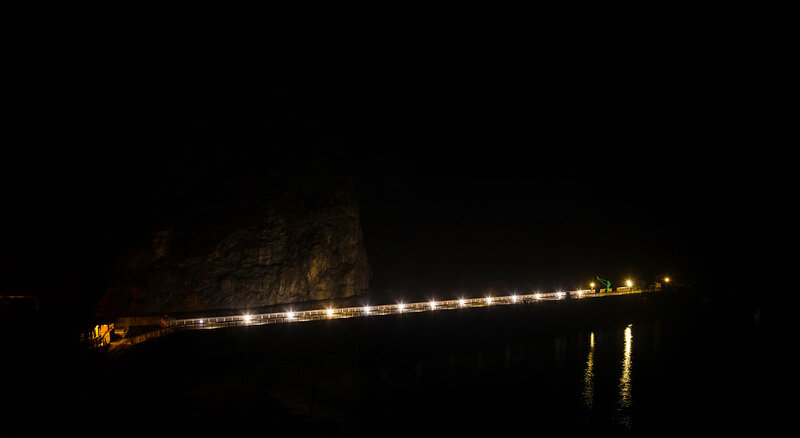 The pier lit up in a string of lights at night, which I imagined would illuminate the rock and create a soft contrast against the blue-dark of night. Thanks for taking into account the photogenic potential of your public works, Trinidad Bay Tourism Bureau. But all was not lost! Seasoned long exposure photographers know of a technique called dark frame subtraction, used to remove repeating noise patterns. After taking a noisy image, one can take a second image with the lens cap on, eliminating all ambient light and capturing only the repeating noise pattern. This "dark frame" can then be applied as a straight up subtraction on the original image, eliminating the noise pattern. With the last image of the lights, it had gotten late enough that the ambient lighting had essentially become zero'd out, and I had a dark frame containing just the pier lights. 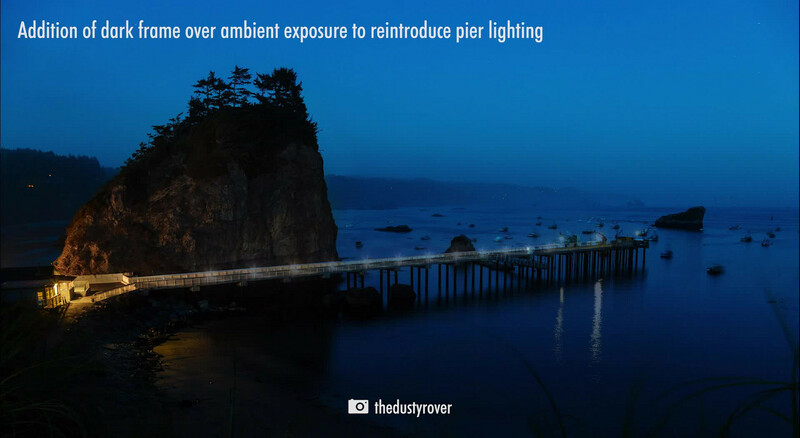 Rather than subtracting, I could apply this as an addition (linear dodge in Photoshop) to my original exposure, adding in the lights to the ambient scene as if pier was lit up at that time. 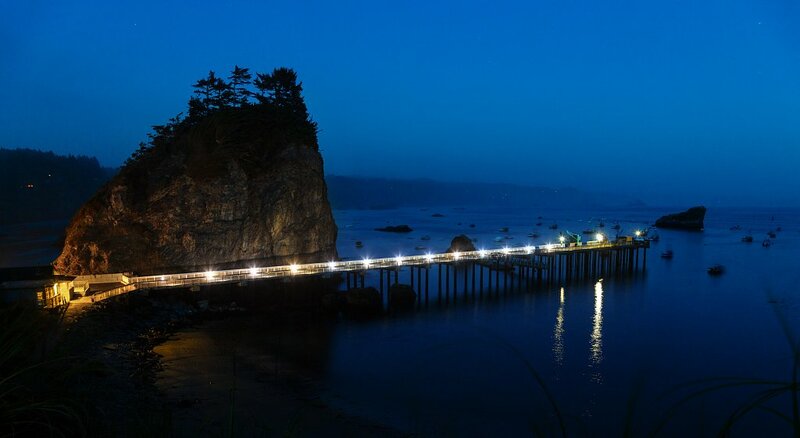 Trinidad PierA composite image of the lit-up pier after it failed to light up after sunset. See my blog post for details on the technique. Voila! I did have to do some masking to exclude the restaurant lights and the very left end of Trinidad, since this was lit the same in both frames and would have essentially resulted in a double-exposure. But other than that it's a very simple and accurate compositing technique for those situations where the cityscape doesn't quite light up on the same schedule as your fading sunset.